Spreading the wings of the Christmas spirit, this little dove is made of fine, white alpaca and likes to perch on a nice spot on twigs and branches. There she can show off her best side and proudly display her beautiful wings and broadly fanned-out tail made of felt. They are very realistic-looking because they were hand-painted using the airbrush technique. So when she looks at you with her lovely black eyes and stretches her beak expectantly, she will show you how much she feels at home during the Christmas season. 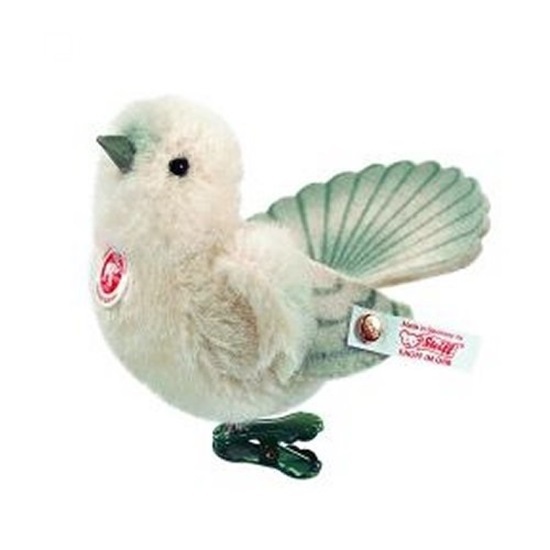 The little dove is limited to 2,008 pieces and also has the gold-plated Steiff “Button-in-Ear”. She is 4 inches long.